Large building and small building demolition. ​Are there differences? First of all, the larger the building, the more room for problems to hide throughout the structure. When we analyze and plan a demolition job, whether partial or total demo, we study every part of the building and determine any and all issues such as any materials that need to be removed and safely dealt with. We catalog all materials and define those materials that that can be properly recycled, and what, if any, materials need to be disposed of in the most eco-friendly way. ​Brick, Concrete, Lumber & Metal Salvage Service is available, and here at DCT we are proven experts at creating the best solutions for removal and salvage; we look after all aspects of recovery and disposal. 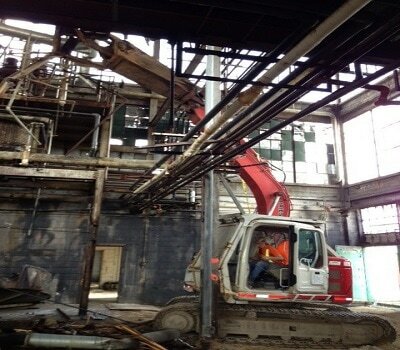 With state-of-the-art-equipment and our years of experience, DCT will manage and execute the most challenging of larger demolition jobs in Toronto, and our reputation attests to the fact that we will closely monitor and ensure safe, yet rapid tear down of buildings with guaranteed customer satisfaction. Once the building is down, there is still much work to do. The displacement of materials, the removal of the concrete foundation involving concrete crushing and removal. ​Our expertise ranges from the razing of large buildings to taking small interior spaces and gutting them, no matter the business types, and we can carefully dissect a shared partition wall keeping the adjacent building in place without affecting it. Partial demolition requires patience and more obviously, precision when working. Picture a building that needs to demolished and it sits in a tight space between two other buildings. ​We understand that the excavation process needs to be quick in order to keep your project on schedule, so we plan every step carefully so that when the excavation process starts the job can be done quickly. By using top of the line equipment planning out projects and having experienced workers we minimize the possibility of any issues occurring or becoming evident midway through the process. We get the job done quickly and right the first time so the construction can be resumed as soon as possible. Quick reference for services in Large Structure Salvage of Silos, Barns, Bridges and more. Imagine the amount of older industrial buildings that have become what are known as loft apartments. They usually start with an old factory or commercial building that has reached its life-span, or a building that can no longer justify its existence, especially where real estate property values have begun to skyrocket. These buildings need to be demolished from the inside without affecting any structural damage, or allowing any pipes or hazards being mishandled and causing problems for the developer. There is usually a hazardous materials evaluation and proper remediation follows from there. ​From small homes to large factories, we know how to carefully construct a plan for Interior demolition that will not compromise both the structure, and the safety measures that need to be in place. Interior demolition often occurs while businesses operate as usual, whether it's the business owner or fellow business owners who happen to be in the vicinity of the demo area. Make Demolition Company Toronto / Home Legla and Restoration Services your first choice cuz we really care.